The overall objective of the SysMedPD project is to further explore and identify novel drug candidates capable of slowing down the progression of neurodegeneration in the subset of Parkinson’s Disease (PD) patients with overt mitochondrial dysfunction. The research during SysMedPD will specifically focus on monogenic forms of PD that involve mitochondrial abnormalities as a primary or secondary phenomenon, which is estimated to account for 10% to 20% of the total number of PD patients corresponding to 1-2 million people. Equipped with a budget of €5.9 million, the SysMedPD consortium’s objectives are to leverage national but especially European investments in the systems biomedicine sector, to improve means for PD detection and therapy development, and to commercialise the project results so the society as a whole can benefit from the results. Establishment of a monogenic PD cohort and generation of a Mito-IPD cohort, each sharing the mitochondrial PD signature. This will help to focus on subsequent preclinical model development and the application of these models to develop new therapeutic candidates on mitochondrial dysfunction in PD. 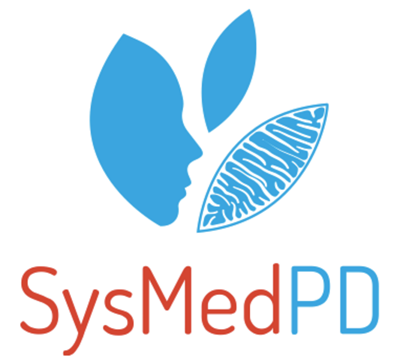 The SysMedPD consortium pursues an interdisciplinary research approach bringing together clinical research, engineering and computational biology. Eight partners from five European countries will collaborate during the project’s lifetime from December 2015- November 2019 to apply a systems biomedicine approach. The project consists of five scientific work packages, each of which is either a step toward the development of candidate neuroprotectants or in support of steps toward the overall objective. WP 1: Generation of genetically and phenotypically stratified PD cohorts and biomaterials WP 2: High throughput in vitro screening platform for Parkinson’s disease WP 3: In vivo neurochemical and metabolomic elucidation of lead compound therapeutic response in humanised mice WP 4: Development of metabolomic and morphological phenotyping of mitochondrial dysfunction WP 5: In silico modelling of Parkinson’s disease Two additional work packages, management and coordination as well as dissemination and exploitation, act to support these scientific objectives. All of the key personnel have been hired and efforts are under way in each work package. It is too early to report anything specific. It has been very enjoyable thus far seeing the ideas in the proposal come to life. This project has received funding from the European Union’s Horizon 2020 research and innovation programme under grant agreement No 668738. The funding periods spans December 2015 to November 2019.